Synopsis: A powerful and important book for fans of Mark Haddon, THE SILVER LININGS PLAYBOOK and Jay Asher. Oh deary me… this book broke me. To be fair, I’d had a bad week, read some ‘Debbie Downer’ books and just generally was feeling low. Forgive Me, Leonard Peacock had me in fits of tears. I remember high school, hell, middle school even, and feeling worthless at times. I remember feeling like I had no friends and the few that I did have were incidental. I remember the darkest days all too well, days when life seemed like it would never get any better. I was Leonard, at times. I think we all are at some stage. Quick’s book was touching and emotional, particularly the “letters from the future.” I loved that. I enjoyed the quirks and the stories about his four friends, particularly his Bogart obsessed neighbor. There was just something so comedic and yet pathetic about each of them… you can’t help but chuckle at how sad everything is. This is one book I’ll be passing on to my younger sister, D, who is in the throes of her Leonard years as we speak… high school. I think she’ll appreciate it. 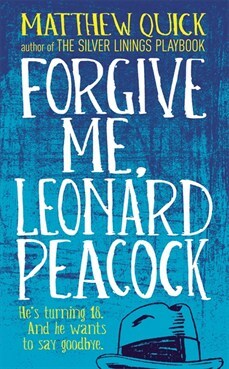 For more information on Forgive Me, Leonard Peacock or on Matthew Quick (yes, he wrote Silver Linings Playbook), head over to Headline’s website or pop over to Quick’s website. I may be on a blogging break but that doesn’t mean you can’t get in touch! You can still tweet me at @stephanie_khani or @londondiaries1. Alternatively you can email me at emailthelondondiaries [at] gmail.com.